1C beans—preferably homemade: black beans, pinto beans, cannellini beans, adzuki beans, etc. NOTE: You can use 1T of dried Italian seasoning or other seasoning of your choice in place of the fresh herbs but it won’t be as tasty! Cook rice in a small saucepan by adding 1 1/2 C filtered water and rice. Bring to a boil, reduce heat, cover and simmer until rice is cooked, about 40 minutes. Remove from heat and leave lid in place for 5 minutes. Do not remove lid until the 45 minutes is up. In the meantime, add water to a large pot and bring to a boil over high heat. Wash the bell peppers, slice off the stems, cut them in half, and clean out the membranes and seeds then add them to the boiling water for 3-5 minutes. Remove immediately with tongs or drain water through colander in sink then remove peppers with tongs and place on paper towels to drain. Note: you can skip this step and bake 5 minutes longer, peppers will be al dente and retain more nutrients. Meanwhile, process the tomatoes in a food processor or blender with the fresh or dried herbs, the onions, and the garlic, then transfer to a medium saucepan and simmer until thickened. In a medium size frying pan, brown ground beef or turkey. Drain excess grease then place beef or turkey on a paper towel covered plate to draw away any remaining grease. If making the plant-based recipe, please skip this step. In a large bowl add: your choice of beef, turkey, or beans, the cooked brown rice, the cooked tomato mixture (reserve about 1/4 of it for topping the stuffed peppers), shredded zucchini and carrots, finely cut celery, salt, and pepper. Oil the bottom of a casserole dish large enough to hold all 8 pepper halves. 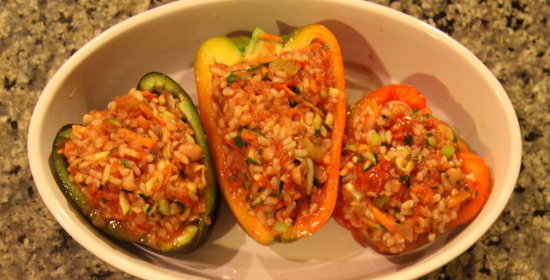 Then fill each bell pepper half with the mixture from the bowl and arrange in casserole dish coated with oil. Put a small strip of the reserved cooked tomato sauce, sideways across the top of each pepper. Cover and bake 25-30 minutes, depending on how large the peppers are. Pepper should be tender and filling should be hot.